SCVHistory.com | CAL FIRE: California Fire Siege 2007, incl. Buckweed, Ranch, Magic Fires. Including Buckweed, Ranch, Magic Fires in Santa Clarita Valley. California Department Forestry and Fire Protection (CAL FIRE), U.S. Forest Service, California Office of Emergency Services. In October of 2007, a series of large wildfires ignited and burned hundreds of thousands of acres in Southern California. The fires displaced nearly one million residents, destroyed thousands of homes, and sadly took the lives of 10 people. Shortly after the fire siege began, a team was commissioned by CAL FIRE, the U.S. Forest Service and OES to gather data and measure the response from the numerous fire agencies involved. This report is the result of the team's efforts and is based upon the best available information and all known facts that have been accumulated. In addition to outlining the fire conditions leading up to the 2007 siege, this report presents statistics — including availability of firefighting resources, acreage engaged, and weather conditions — alongside the strategies that were employed by fire commanders to create a complete day-by-day account of the firefighting effort. The ability to protect the lives, property, and natural resources of the residents of California is contingent upon the strength of cooperation and coordination among federal, state and local firefighting agencies. By utilizing the information contained within this report, fire managers will create lessons learned that will be utilized continually to improve the response to wildfires. 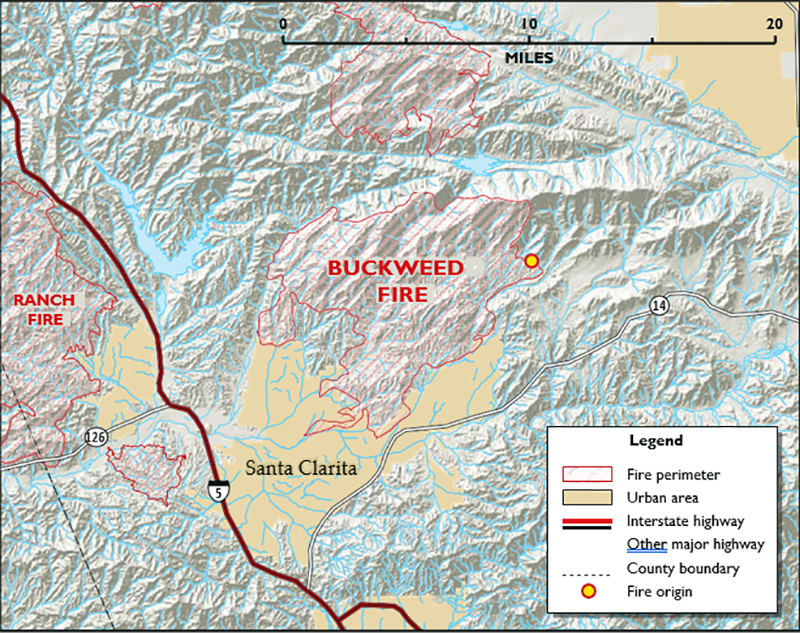 The Buckweed Fire was reported near Mint Canyon Road and Sierra Highway at 12:55 p.m. on October 21, 2007. It was rapidly spread by strong, gusty Santa Ana winds. By 4:30 p.m., about 2,000 acres had burned, Sierra Highway and many other roads were closed, and the fire was moving toward the city of Santa Clarita. At 5:43 p.m. the fire was reported to be about 10,000 acres, numerous structures had been destroyed, and another 200 were threatened. Evacuations were in progress for upper Bouquet Canyon, San Francisquito Canyon, and Green Valley areas. Evacuation centers were established at Hart High School, Saugus High School, Crown Valley Middle School, and Meadowlark School. As of 8:25 a.m., on October 22, the Santa Ana winds continued. The area had burned nearly 30,000 acres, and at least 25 structures had destroyed. As the fire burned toward the Magic Mountain area of Santa Clarita, evacuations continued and now included Vasquez Canyon, Copperhill, and areas up to Spunky Canyon. A total of 3,800 residences as well as major electrical transmission lines were threatened. The L.A. County Sheriff, and Animal Control coordinated animal evacuations. Only residents were allowed into the evacuation areas. Both the Saugus Union School District and the Castaic School District cancelled classes. The incident exceeded capabilities of available firefighting resources. By 2:00 p.m. the burn area exceeded 35,000 acres. It was estimated that 15,000 people were evacuated from 5,500 homes. The south flank slowed significantly when it ran into a sub-division surrounded by a greenbelt. The west flank held in San Francisquito Canyon. As winds eased later that afternoon, the fire spread slowed, containment lines held, containment increased and the threat to the communities diminished. It was noted that there were impacts to archeological sites along the service road to Drinkwater Reservoir and along Del Sur Ridge, and also that fires threatened the endangered the Red Legged frog, Arroyo toad and Stickleback fish. At 5:45 pm, conditions had improved, evacuations were lifted and residents were allowed return. By 6:00 p.m. on October 23, containment was at 80&percnt;, and mop-up, patrol, and containment line improvement were the main focuses. 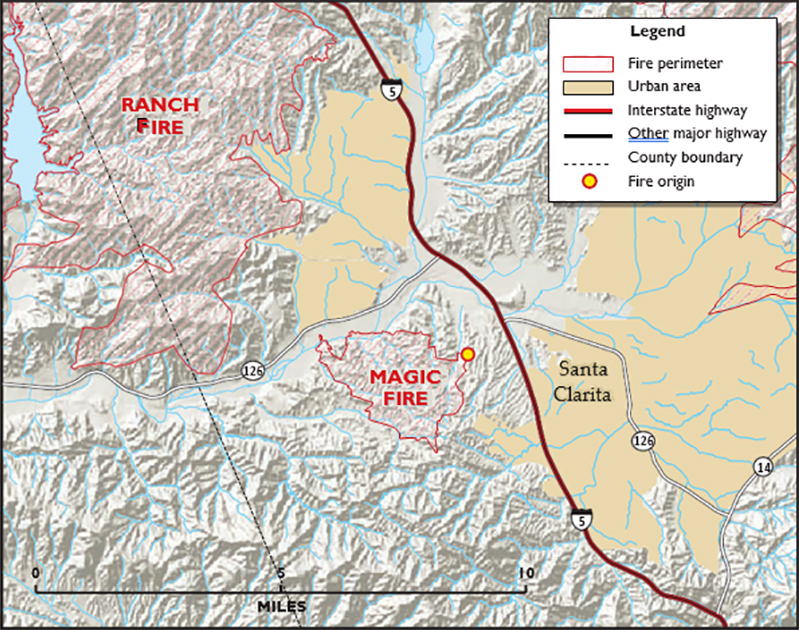 Both the Buckweed and nearby Magic Fires were 100&percnt; contained on October 24, 2007. *Figures shown reflect direct suppression cost estimates by stated agency. Other federal, state and local agency costs are not included. Additional expenses not related to direct suppression (rehabilitation, agency overhead, etc.) are not included. The Magic Fire started shortly after 2:00 p.m., October 22, near the Six Flags Magic Mountain amusement park on the western side of Santa Clarita. By October 23 the fire had grown to 1,200 acres. Only 20&percnt; contained, it was considered a threat to Simi Valley if the winds continued. However, weather conditions improved, and by evening there was little fire spread, and control lines were holding. Efforts shifted to mop-up and patrol. The Magic Fire was 100&percnt; contained on October 24, 2007. The Ranch Fire started at 9:42 p.m., October 20, 2007, on the west side of Interstate-5, approximately seven miles northwest of the community of Castaic, in Los Angeles County, and was burning to the southwest toward Ventura County. Santa Ana winds were blowing 25-to-30 miles per hour, and gusting to 40 miles per hour. The fire was spotting up to 1/2 mile, and by 6:00 a.m. October 21, it had burned 500 acres but was slowing down. The winds had calmed to 10 miles per hour, with gusts to 20 miles per hour, and the relative humidity rose to 45&percnt;. Additional resources arrived and there was no eminent threat to structures unless the winds picked up again. Three hours later at 9:00 a.m., the fire was still holding at 500 acres. However, the winds picked up again and spread the fire from a rural area without threat to structures, to 6,000 acres. By the end of the day, it threatened the communities of Fillmore, Piru, Ventura, Ojai, and the Condor Reserve and Sespe Wilderness areas. Winds continued to drive the fire, and by the morning of October 23, the area burned exceeded 50,000 acres, and the fire became well established in Ventura County. If the winds continued, the Buckweed, Magic, and Ranch fires were expected to burn together in 24-to-48 hours. By October 23, seven structures were reported destroyed, and Highway 126 was closed. An evacuation center was established at the Fillmore Veterans Memorial Building. Large animals were evacuated to the Ventura County Fairgrounds and small animals were moved to the Camarillo Animal Shelter. Evacuations occurred in Chiquito Canyon, Halsey Canyon, Val Verde, Hopper Canyon and toward Fillmore. Structure protection was provided for Hasley, Piru, Sespe, Fillmore, and structures along Highway 126. By the morning of October 24, the winds had calmed and fire activity was minimal with some topography- driven short distance runs; flames were visible from Interstate-5. Evacuations were lifted and efforts refocused on securing the perimeter and mopping up. Line construction was completed on the west perimeter of the fire on October 26; the fire was 97&percnt; contained by October 27. 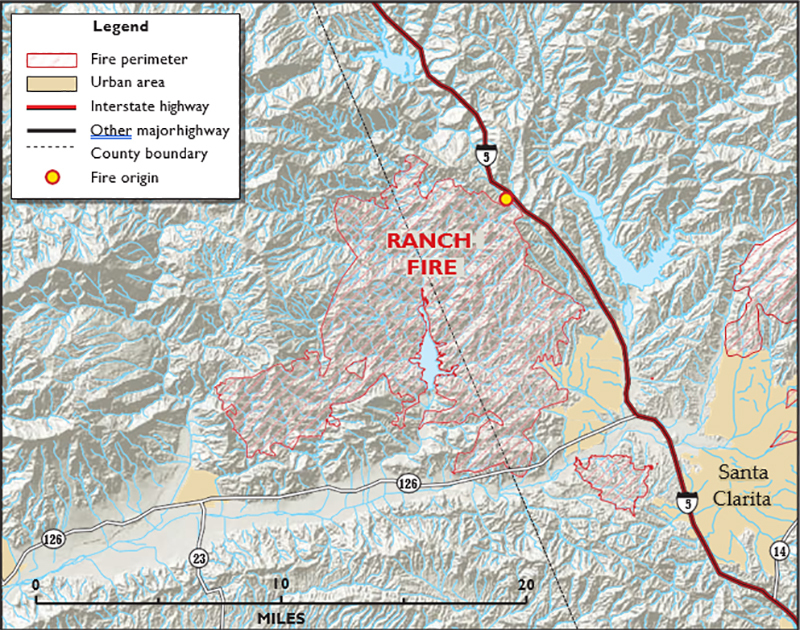 The Ranch Fire was 100&percnt; contained on October 30, 2007. LW3443: Download original pdf here.